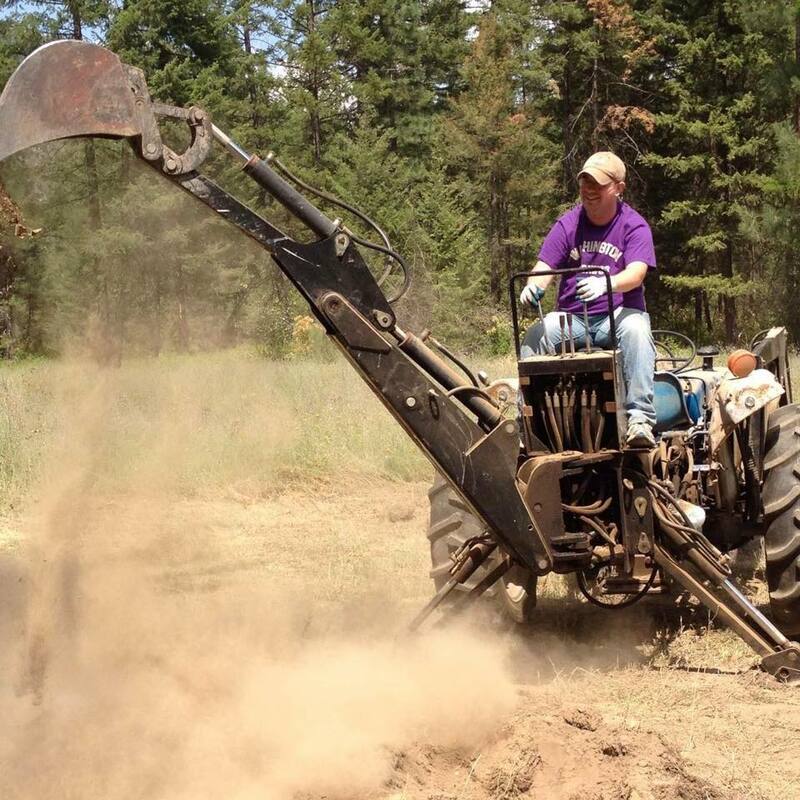 If you follow our Facebook like you should, you might have occasionally seen a picture of me driving a backhoe. If not, here is a picture of me driving a backhoe. A backhoe is a really important piece of equipment on a farm. Sometimes you just really need to dig stuff up quickly. While we’re laying wire and pipe ahead of the impending freeze, the backhoe has been invaluable and allows us to do in a few hours what would have taken me all day — or a couple of days — to do. Is the hole deep, or am I that short? I had never, ever driven a backhoe, a tractor, or any other piece of heavy machinery prior to coming out here to the ranch. I’ve driven a riding lawnmower, but honestly they don’t count. A backhoe is a far cry from driving a car. They handle differently, they have attachments that can do powerful things, and for those reasons, you should exercise caution around them. Slowly but surely, though, I’ve been getting more comfortable with it, even though I still drive the tractor part like an old lady. (Seriously, moving it from one part of the ranch to another was the slowest I’ve gone since getting stuck in Seattle traffic. It even made Steve cry.) I’m feeling pretty good on the digger side though. It reminds me a little of a video game in a way, what with the controls — except you’re operating a bucket in real space. And you can use that bucket to move large rocks. And that’s awesome. We dug up some stuff on one part of the property, and we’re digging trenches on another part now. I like digging. 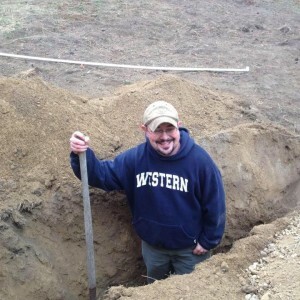 On Monday, though, we were digging and part of the backhoe failed, sending me sprawling. I landed on a metal strut and bruised my thigh pretty badly. This picture was taken this morning (Friday) and doesn’t even begin to capture the swelling I had on Monday and Tuesday. 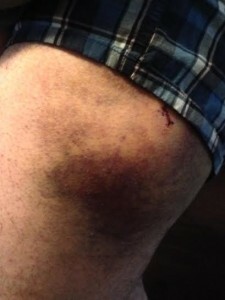 My thigh looked like it had a goose egg lodged underneath the skin. I’m glad, actually, that the swelling has gone down and the bruising is settling in, because it hurts a lot less now. Still something to keep an eye on, though. Meanwhile, we expect to be fully powered this weekend, and sewer should be coming well along too. We get closer and closer to having a functional place! V. exciting. OWIE!!!!!! That looks like it hurts! I admire you so much, I wouldn’t have a clue on what to do on a backhoe, shoot, I didn’t even know that it had more than a turn on/off switch! Soon enough all this hectic time will be gone and just memories, and the house will be finished and you will be living there and making a whole slew of new memories. It must be hard too, to try and get this all done while you can and the ice and snow have not come yet. That will be a whole new set of memories and I can very well see you in later years sitting in your chair telling young people “I remember when…..” stories. Take lots of photos even if its just to jog your memory cells. You are doing so well, I am proud of you!